2017 - "HELP! We're Hosting a Short-term Missions Team!!!" 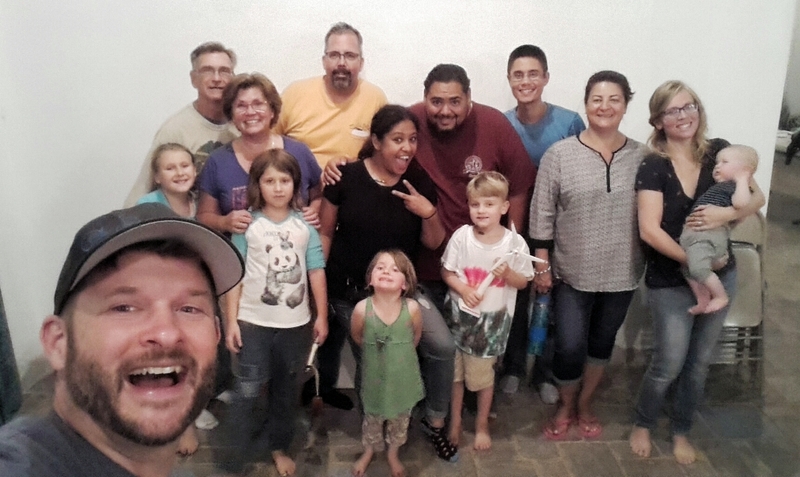 A recent highlight for us at Rancho Oasis was hosting the first ever team from Bloomingdale Church, my original home church. Over three decades ago, I, Jon, started attending the church with my family before entering junior high and accepted Christ as my Savior before my senior year of high school! Rather than share my perspective on the trip, one of the short-term team members gave me permission to share his first time experience. Short-termer John Wilkes with Mathias. Our trip began a few months before we actually set foot on Honduran soil. Seven of us from Bloomingdale Church in suburban Chicago gathered together on a regular basis to learn how a successful trip is achieved. Some of us already had mission trip experience and others none; I was in the “none” category. 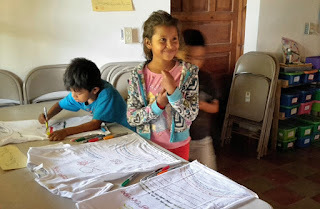 We learned about the Honduran culture and each other during these meetings. So many subjects spin off of these two main topics and the missions guide book, “Help! We're Going on a Short-term Trip”, was used to help keep things on track. Regardless of prior missions experience, this group had never traveled together before. We came together well and by the time we departed I felt very much accepted and the group had become a team. When we loaded the bus from the church parking lot I remember feeling so relieved to finally be going and the fear I had months before when I committed to actually do the trip was gone. Almuerzo @ Las Tejitas! Que Rico! Once we arrived at the airport in Tegucigalpa we were met by Jon Beard. Jon greeted us and after a couple of quick currency exchange transactions we swiftly navigated to our transportation. 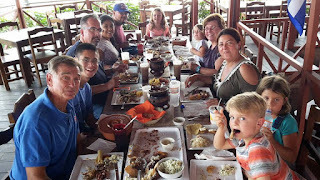 Once in the rental, we stopped at a local restaurant where Jon had pre-arranged a great meal to welcome us to Honduras. Following lunch, we were underway to the retreat center; which would be our home base during the trip. Once at the retreat center we met Irma and her daughter Marcela who are the proprietors. 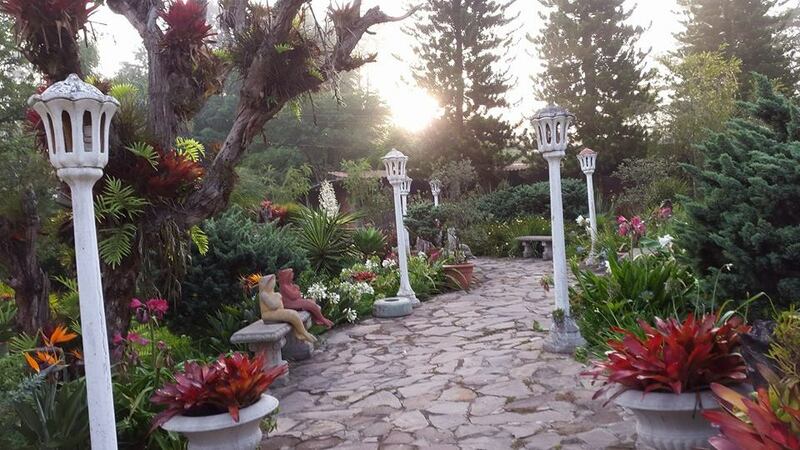 This property is so beautiful with many succulent plants and quiet places of refuge for prayer and reflection. “I could live there,” I thought, and then when we ate our first meal there and I knew I was right...I could actually live there! We had two meals a day there: breakfast and dinner. The accommodations were very clean and inviting. Hot or very warm showers and all that stuff but the hospitality and clearly the blood, sweat and years of effort to cultivate this place was the real allure. The retreat center, La Posada del Pescador. I would wake up around 0500 and spend time alone with the Lord in one of the many places available to do so. When everyone was up and about we would meet for group prayer for the day and the Ranch then have an awesome breakfast. (Did I mention the great chow?) We would then load up in the van and head to the ranch which I is about 40 minutes up the mountain. Many times this drive was through the cloud as in we were actually driving into a cloud. Each day we would depart the ranch around 1730- 1800 and head back to the retreat center for dinner, group discussion/ prayer and turn into bed around 2000-2100. Along the way we prayed for each ministry. 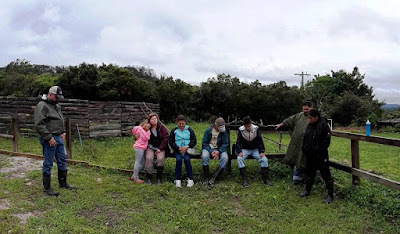 Once we completed the prayer hike, we went into the house and were able to meet Marillyn, Jon’s wife, who was working away with preparing lunch for this big group of people. It was a fine meal and gathering, yes indeed. After lunch we discussed all of the week’s projects and bible studies, skits and songs, crafts and children's activities scheduled for the rest of the trip. I will say that the level of communication and group interaction was great. This tool is used well and helps keep things running smoothly. Jon Beard and our group leader, Stuart Guild, did a great job with communication. We spent each of the first few days tackling the list of facility maintenance and system upgrades to keep the Ranch in bounds and moving forward. 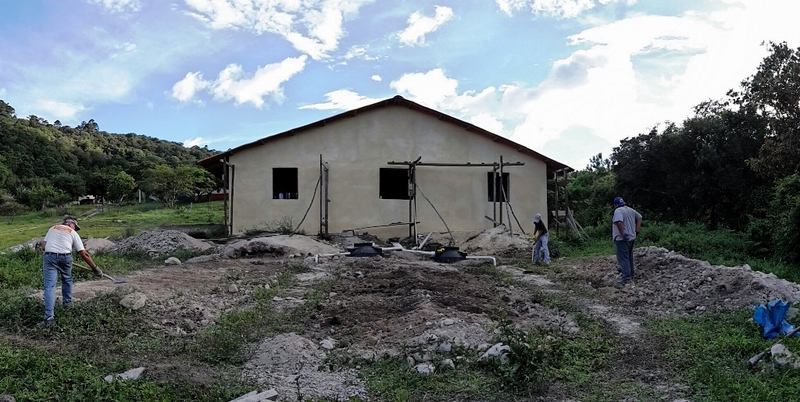 Painting, door and hardware repair, septic system installations which are actually a bio-digester system for the staff housing. There was some demanding manual labor involved and I will admit to wishing I had not enjoyed those last couple of milk shakes before I left the States... but all was good. We came together well as a unit during these days of labor for Jesus and the Ranch, the actions of faith in place of the words about faith were in full motion. 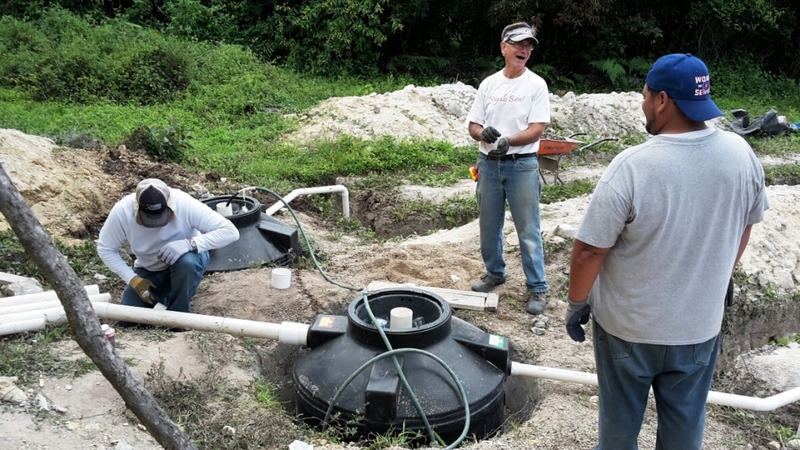 Installing Staff Housing "Bio-digestor", a human waste composting septic system. Back filing dirt over sand & gravel leech field. Karen Julisa preps her VBS craft! The last few days we were able to meet one of the main reasons for the Ranch: the youth! The vans, the Ranch 15-passenger van and the rental van, would bring in the children. One group in the morning and one in the afternoon. I will say that my often grumpy fifty-two year old self was choking back some emotion on more than one occasion. I learned that children are children everywhere. 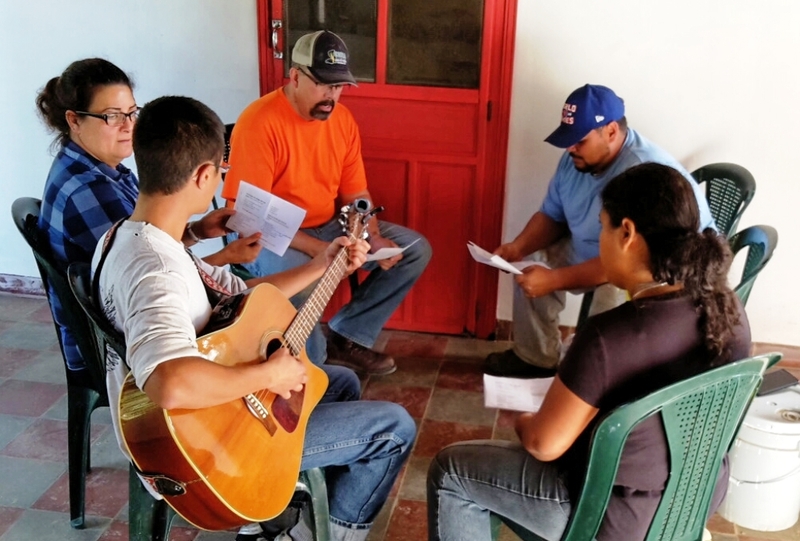 When we sang the songs and the skits were performed, the faces were cheerful and laughter was present. The kids truly love the Ranch. When the lessons turned to activities (either crafts or games) the facial expressions and laughter were those of truly excited and happy kids. These children brought me back to when times were simpler and interaction was itself an activity to anticipate with excitement. I did not see any smart phones interfering with their fun… except mine... but, hey, I was documenting! 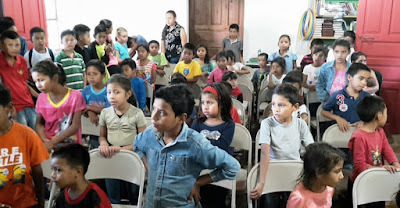 The last couple of days there were so many kids and I believe the last day had close to sixty. Final photo with afternoon VBS kids! John shares from the Word & his testimony. 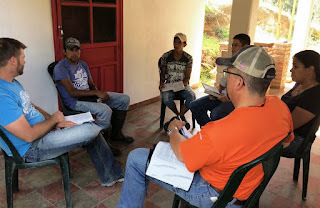 A highlight of the trip for me was giving my testimony, as well as leading a bible study with the staff. I do not speak Spanish, so translation was needed, a first for me. All went well and I believe there was at least one person there who needed to hear my story and how Jesus has always loved me even when I could not love myself. How He surrounded me with so many good people that I could not possibly deny it and how He watched over me while being such a self-righteous fool. 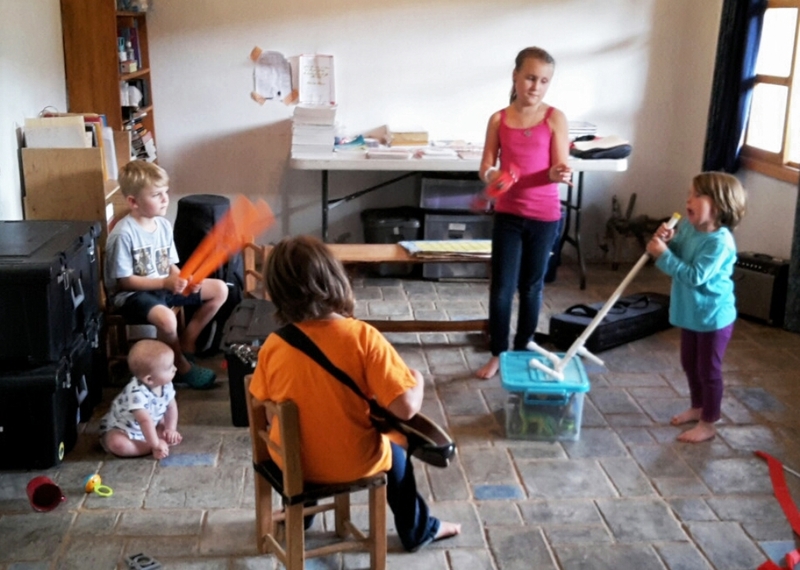 John teaches the afternoon "readers" VBS group! 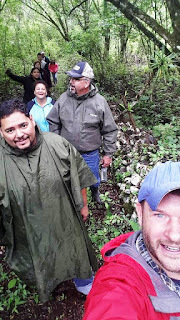 Our trip was so busy and full of interesting days that I look back on all of it and see how much can be done when good people do something together. We did all of this and still went to church in the capitol city on Sunday. We also did some tourist stuff, like: we visited a couple nearby "pueblos" and picked up souvenirs, we visited a park that had a giant statue of Jesus looking over the capitol city and I visited a couple of hardware stores and bought materials for the Ranch (This is the equivalent of a shopping trip to the mall of America for some people) but to me it was awesome! My perspective was changed one day when I was asked by Jon if I would like to go with him to drop off the kids at their homes. We made our way up and down the very rough terrain roads. 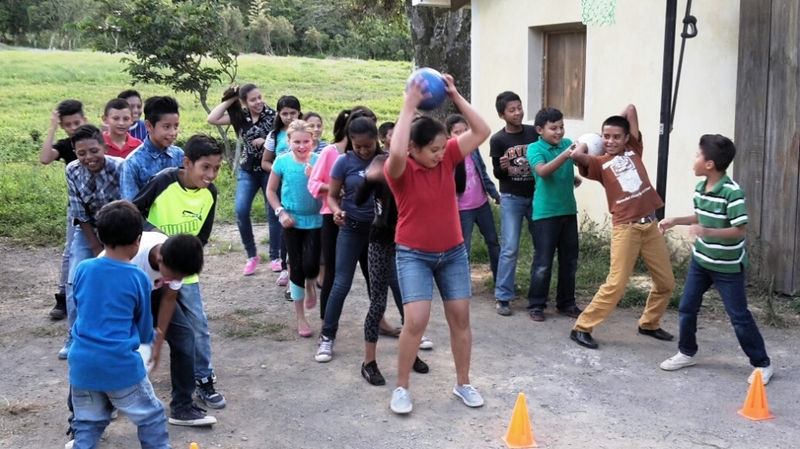 Up to this point, I had just been playing activities like soccer and group races with these kids. I see their spirit and laughing faces and genuine enthusiasm for life through all of these things. Now, outside the Ranch, we pull up to a small structure made of miscellaneous materials and not big enough for two motorcycles. Jon calls out for three kids that we are here and they hop out and walk down the trail to this place, their home. My heart sank and I know this is a fine place for people to live who don't mind figuring out how to cultivate and manage the meager resources available. 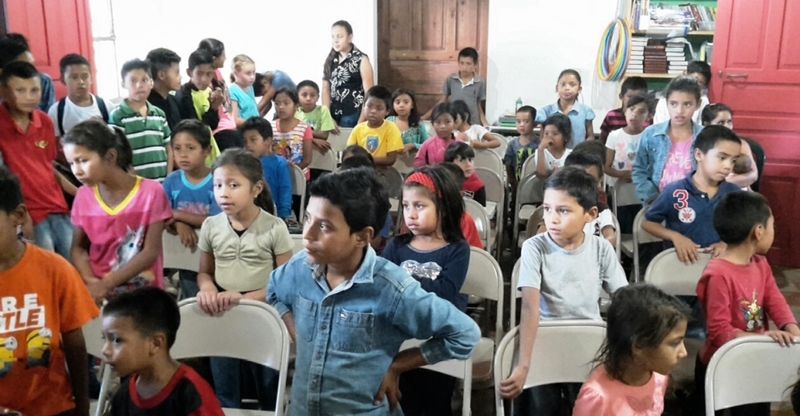 However, I saw young lives with not much more to hope for, but the RO4Y mission offers them as a way to real hope! Their other options are hard to comprehend, especially for a person who has so much at their disposal, like myself. The contrast of the joy at RO4Y and the reality of their daily struggle hit home for me this moment and I will never forget the seriousness of Gods calling on the Beard family in Honduras. The reflections I have from the trip are clear as a bell and also not so clear. I also see the massive work load on Jon and Marillyn with five children. This alone is an enormous responsibility and work. There is only one who can make it possible for a man and a woman to have the courage, determination and love to take on a family of seven AND a mountainside of children: Jesus! The strength that come from a faith in Him is clearly evident when looking back on their mission. Their desire to help is cultivated when looking forward toward their vision God has given them. The task is worthy and I highly recommend putting faith into action with a trip to Honduras and see what the Beard clan has in store for you. I personally can’t wait to go back." It is awesome to see that God continues to use short-term missions experiences to not only "lengthen our reach" into the community & build up the Ranch's infrastructure, but to touch the lives and hearts of the short-term missionaries; ultimately, strengthening their faith and emboldening them to continue to serve Christ in their own "backyard" mission field. on the RO4Y Facebook page. 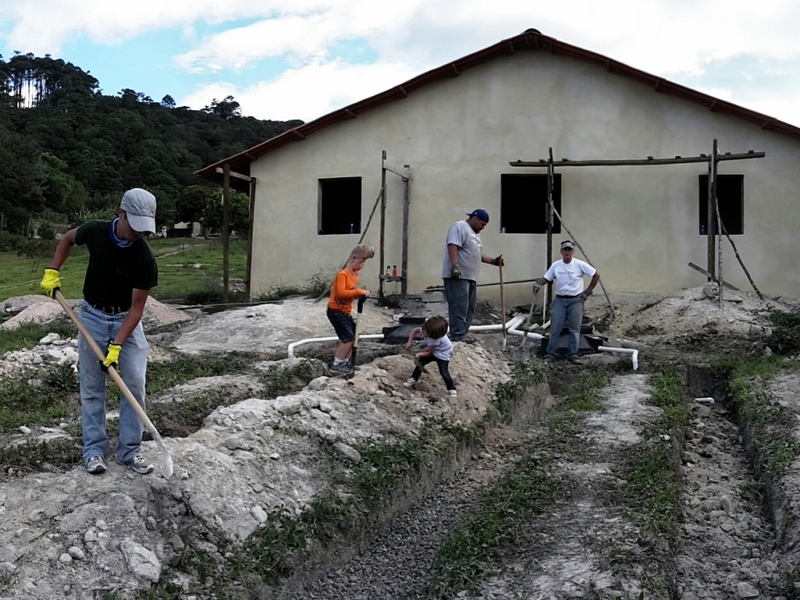 If you, you're family and/or a small team are interested in visiting & serving at the Ranch, please don't hesitate to contact us to began discussing dates, cost and projects! We look forward to seeing whom God brings to Honduras in 2017 & 2018!!! Please continue to PRAY for Rancho Oasis & the Beard fammily!